Muslim Yellow Rice with Chicken: Muslim Yellow Rice with Chicken, Sweet-sour Chilli Sauce, cucumber relish and soup (Kao Moek Gkai). Kasma teaches this dish in Advanced Series Set D (class 2). 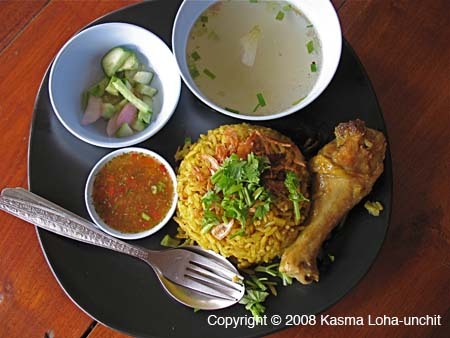 See also her recipe for Muslim Yellow Rice (Kao Moek Gai).